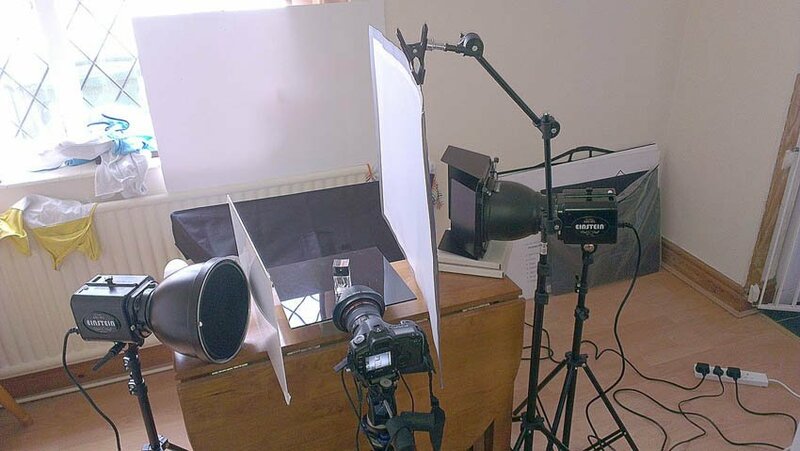 This is a behind the scene which will give you an idea of how to photograph glass. The technique shown here will work for any subject with clear glass or plastic. 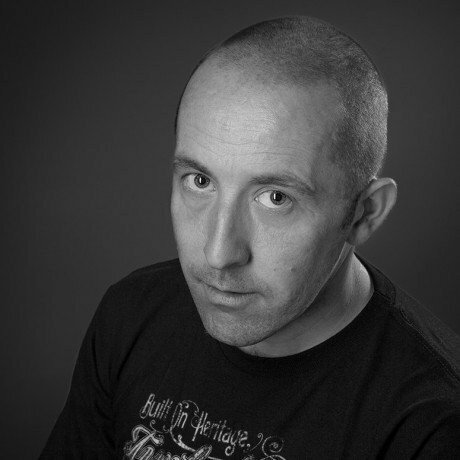 Hi guys, my name is Paul Whittingham and this is a brief tutorial on an aftershave bottle image that I recently shot. Ok, first of all I should apologize for the quality of the set up shots. Had I known this would turn into a photography tutorial I would have made sure of taking some better images and not with a phone. Furthermore i would probably have made an effort to remove all the baby bibs from the scene!……as you will see, I haven’t a studio so everything I shoot has to be done in my tiny back room or taken to work where I have a little more space to play with. 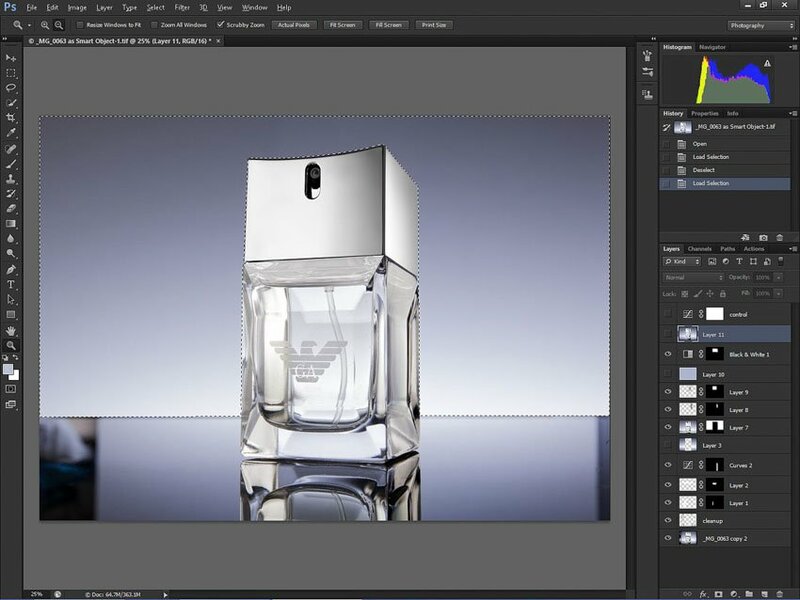 Additionally, I don’t have the step by step layer stack in Photoshop recorder to show precisely every step of photo editing, so I’ve given an overview of the process of how to photograph glass to the best of my ability. 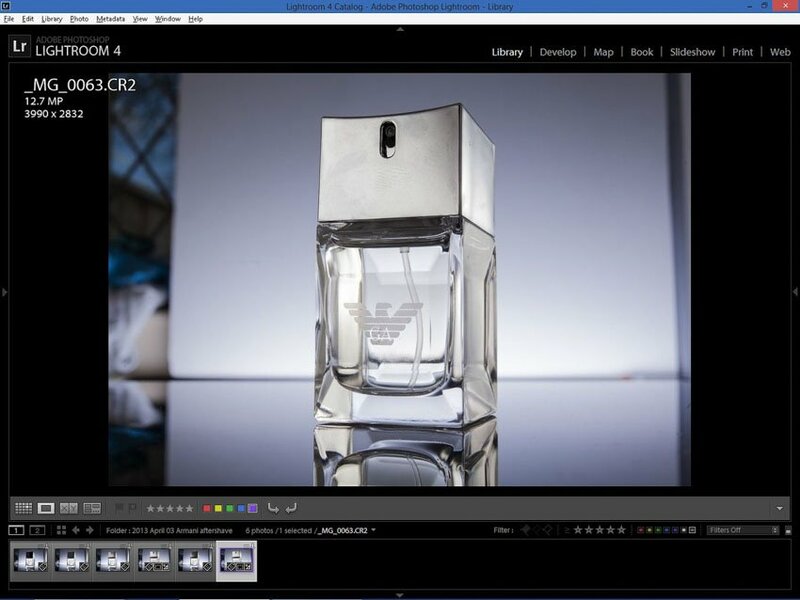 After watching some of Alex’s recent photography tutorials, I realised the small aftershave bottle was going to need shooting from a low angle, and with a wide angle lens to try and introduce as much perspective distortion as possible for a more dramatic look. With the bottle arranged on a small piece of black plexiglass, I had the edge of the lens literally resting on it. The shooting angle was from as low an angle as possible without cutting off too much of the bottles reflection on the plexi. For the background, i just used a sheet of white foamcore (carefully balanced on a radiator). 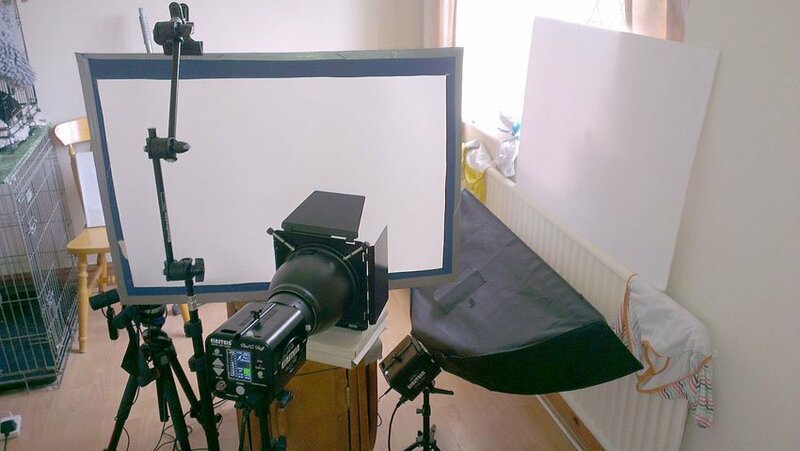 One light in a small stripbox on the floor is angled back up towards the foamcore to produce a linear gradient up it. On the right side of the camera, i used a home made diffuser made from a piece of cardboard, and some Savage Translum taped to it. This is held in place by a Manfrotto adjustable arm on a stand with a clamp. A second light with a reflector and barn doors attachment was used through the diffuser so a gentle gradient could be made on the right hand side of the bottle. Finally the third light (camera left) had a reflector and a 10 degree grid. 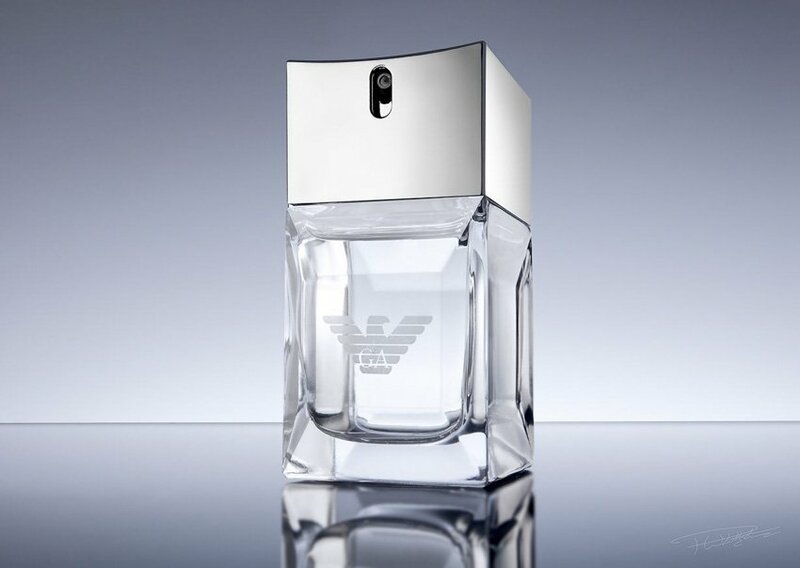 This was aimed through a small piece of thin white plexi to produce a gradient across the front side of the bottles lid. I only kept a few of the shots from this session, but I hope the above shows some of the progression of getting the front side of the bottle lid lit properly by adjusting the power and position of the light and the diffuser/plexi on camera left. To start with, I knew quite a lot of post production was going to be needed. Using a wide lens meant that I needed a much larger background to start with, but that wasn’t available so it was all going to be fixed later. Also the low shooting angle would create the converging verticals that you see both on the bottle and the background. A big surprise was the difference in colour temperature between the background and front lights. You can see the yellow cast on the right side of the bottle compared to the background colour, the same light is reflecting on the inside left hand side of the bottle also. All three Einsteins were set to constant colour mode, so that shouldn’t of been the issue. Both the diffuser and the plexi should be neutral in colour balance also. I’m guessing it was the ageing Bowens reflectors that I rigged onto the lights. I remembered a while back during a live hangout, that Alex experienced the same issue with two different reflectors from Paul C Buff. One had a matte silver finish inside, and the other a polished chrome finish. Same problem with the reflectors I was using perhaps, both are second hand and probably very old. I’ve taken the image from Lightroom into Photoshop as a fully editable Smart Object. Access to the original RAW data comes in handy. When working in photoshop i tend to work on separate layers as much as possible, so if I start changing my mind about something (I nearly always do) I have the option to go back and make adjustments without starting from scratch. Only when I’m certain I’m happy with edits, I’ll start merging down layers and flattening in an attempt to keep the file size workable. In the picture above there has been done a significant amount of cleaning to the bottle and background.It was done with the clone stamp/healing brush/spot healing tools (all done on separate layers). 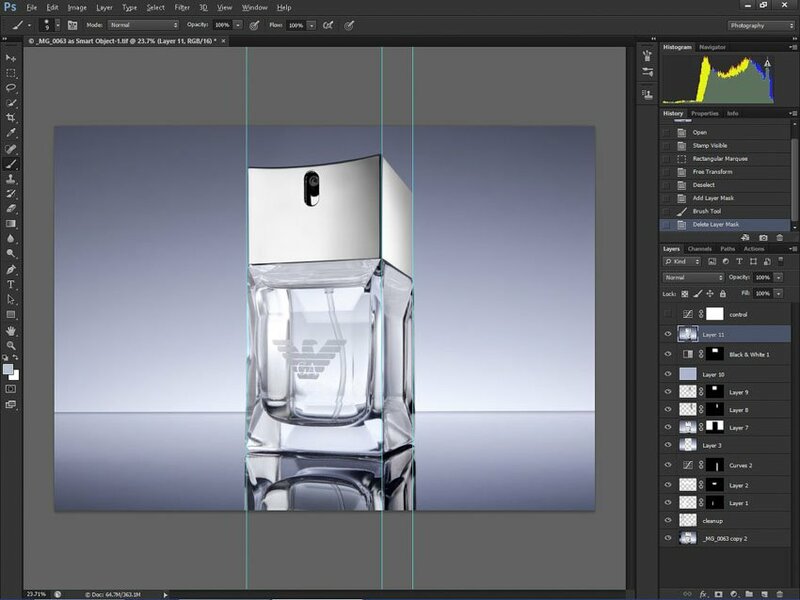 I’ve used the pen tool to create selection paths for the upper/lower background, the bottle, each side of the lid and each facet on the front of the bottle. 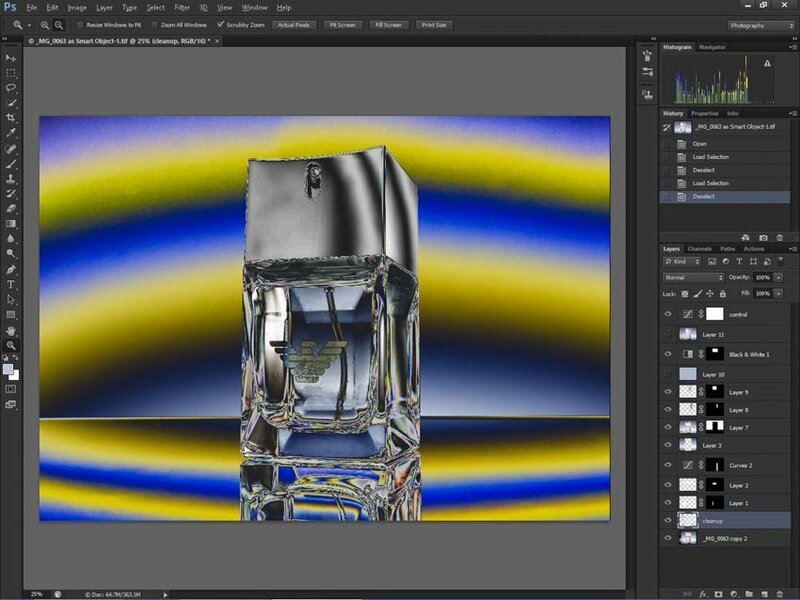 The background has been copied onto separate layers and stretched both horizontally and vertically to fill in the gaps via the Transform Selection Command. The selection for the upper background is visible as marching ants in the shot above. The nozzle in the lid was copied and placed from a separate RAW conversion of the same file, adjustments were made to shadow details to reveal more of it. The top and left facets on the bottle front were touched up and brightened, along with the front and right sides of the lid. I ran the Median blur/Gaussian blur and noise method across the lid surfaces to clean them up. Copying and pasting a selection of the lid onto a new layer, I used the Transform/Perspective Command to correct the verticals with the help of ruler guides (as seen above). More post work on the lower half of the background was done, again – selected and stretched to fill the frame. I use Genia’s crazy S-curve curves adjustment layer to show up more editing imperfections and dust spots that I missed on earlier steps. Thank you Genia for this tip, it works just great! 🙂 The shot above is from an earlier point in the edit, I use the method repeatedly to stop adjustments getting out of hand and causing unwanted artifacts into the shot. Finally I removed the little tube from inside the bottle via the clone stamp tool, (Curtis you were right it looks much better). To finish up, I ran Topaz Labs Clean filter, it does a great job on surfaces and edges if used sparingly. 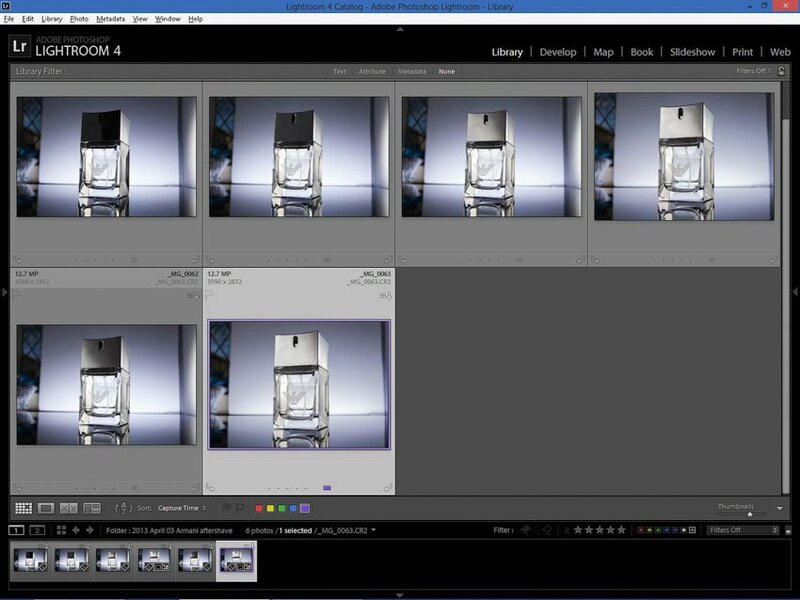 Then the usual sharpening after re-sizing the image for web was applied. Ok guys that’s it. I hope this was helpful, and I think its another example of how something simple can be done in less than ideal surroundings by an amateur photographer.